T-shirt artwork configuration: Large image of the running horse badge emblem, with all trim and scripts in a stunning heavy Golden metallic fleck colour. 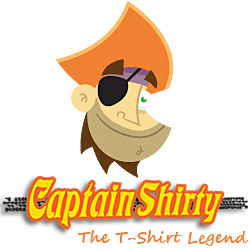 The background images are in a ‘ghost’ appearance, and are of the various Mustang badge or decal models and muscle option codes that were available throughout their productions over the years. 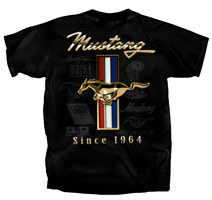 This Tee has the scripts “Mustang Since 1964” in heavy metallic Gold style font, with the Golden ‘Running Horse’, located on the front left of chest. The artwork is of very high standard, with intricate details of the ‘Running Horse Mustang’ badge emblem with the ‘ghost appearance’ of the Mustang badge or decal emblem model variants in the back ground.